There are 11 trails officially designated as a National Scenic Trail in the USA. How many have you hiked? The North Country Trail is the longest of the national scenic trails at 4,600 miles. The trail winds through New York, Pennsylvania, Ohio, Michigan, Wisconsin, Minnesota and North Dakota. Brag about hiking all or sections of the trail with a commemorative t-shirt! It’s time to get back in shape. Don’t pay full price for fitness equipment without checking for deals on #Amazon first! Or an assortment of dumbbells. They say that hiking energizes and invigorates not only your body, but your mind as well. Find some good hiking trails and get hiking. Trail guides like the National Geographic Trail Illustrated Map will get you inspired as to which trail(s) to hike. It’s a modern take on the stylish bomber jacket. Instead of leather, it’s made from a more comfortable 60% cotton and 40% polyester fleece. Sure to be a popular trend-setting look, and perfect to show off your interest in hiking. Regarding Sports is now on TeePublic! Check out our latest designs and take advantage of sale pricing now! “The Trace” is an officially designated National Scenic Trail. Long distance multi-use trails are a great way to see the country and to experience historic sites along the way. The Natchez Trace Parkway is a 444 mile long paved trail with low traffic and enforced 50 mph speed limit. There are numerous historic sites and scenic landmarks all along The Trace. Check it out as a through-ride or experience it in sections. You’ll need a good guide book to find and explore the historical sites. And make sure to grab a souvenir shirt to commemorate your trip. None of the big name brand trail shoes have fit my feet right. The cheaper Hi-Tec brand has suited me just fine….both high and low versions. What’s your go-to trail shoe? There are 11 official National Scenic Trails. How many have you visited? Check out this collection of t-shirts and help promote the National Scenic Trails. Have an idea you would like printed for your company, club, or special event? Use Printful …. It’s easy on-demand, online printing, fulfillment, and shipping! Give your tennis game some zazzle! 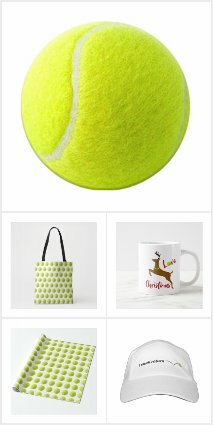 Click here to see this tennis collection on Zazzle. It’s a New Year, DON’T drop the ball. Stay on top of things and get it done! Just in time for Old Rock Day, January 7th! Old Rock Day is an opportunity to enjoy and appreciate old rocks and fossils….like constructing a cairn. 30% off Sunfrog collection this weekend only. Use code FLASH30921. Check out these new designs for the sport of wrestling. Best for high school and college wrestlers; or any wrestler with a sense of humor. Are you a fair weather runner? Bring your workout indoors with a treadmill! I purchased a ProForm treadmill a year ago and love it. I researched them and found the cheapest price at Target….and with the Target Red Card, there’s a 5% discount and free shipping! This model is even better than mine because of the shock absorbers — a nice feature I would love to have. Check out our new page dedicated to products related to PICKLEBALL! Click the PICKLEBALL menu above to see the latest products. Enjoy and as always, suggestions and comments are welcome! Fun shirt for moms who love yoga! Regarding Sports and similar sports themed designs are now on Sunfrog! Check it out!